Harold’s Deli is one of those places famous for its super-sized portions. They have been on Man vs. Food, and a mere scanning of the dining room as you walk to your table will give you an idea of what you are in for. Sandwiches are piled high with exorbitant amounts of meat. Slices of cake are a foot tall, can feed a family of four, and still provide leftovers. The other massive thing you will find at Harold’s? The prices. Yes, if you price out meal items accordingly based on how many people you have at your table, it ends up not being as bad. However, I challenge you to not let your jaw drop when you first open the menu, and see deli meat sandwiches approaching $30, and a roast beef dinner for $80. Slices of cake were also around $20. Again, if you have a table of three or four and are interested in sharing (recommended), I suppose that will lessen the shock. 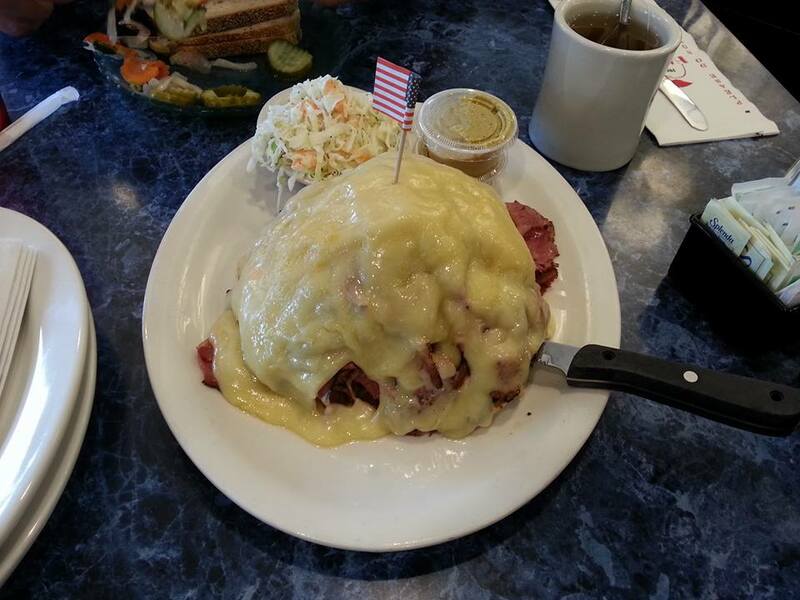 We decided to split a pastrami sandwich that came served on rye. It was $25.95 and they had to charge an additional $3.75 to add Swiss cheese. What seemed like five pounds of meat came served on two tiny slices of bread, so soggy and overwhelmed that they would have been better off not putting it there at all. There is a complimentary pickle bar where you can grab more bread and make your own sandwiches off of the main one they brought you. Rest assured, the pastrami was amazing. Maybe not “World’s Best!” as advertised, but lean, juicy, and incredibly flavorful. It kind of justified the price, though I am peeved they had to charge for cheese, which is usually a staple when it comes to pastrami. In fact, they charged you for anything additional, even lettuce, tomato, or onion if you wanted. Ingredients which are normally free at any restaurant. But go ahead and help yourself to a free pickle. Side dishes, also meant for sharing are accordingly priced, like $9 for mashed potatoes and $12 for a knish. We did not totally pig out. Though we put up a good fight, there was still enough left for another sandwich. The bill was over $40 for the one sandwich and two soft drinks. Even though it was great, I still felt a little screwed. We were in and out of there before we could blink, money spent and gone. There’s a difference between giving out large portions because you want to feed someone and giving so much food because you want to shock and charge a ton of money. The menu does state that plates are meant for sharing. Some of the dinners are meant to serve four or five while sandwiches say two or three. They can even be made extra-large to accommodate more. And there is no plate share charge, so I credit them for that and being up front about it. I suppose this is a place to come if you have a large party and want to order a couple of dishes to try to maybe get your picture taken with a slice of cake as big as your torso. Other than that, I’m in no rush to go back. 3.5 out of 5 stars. This review was previously published here. Harold’s Deli is located at 1173 King George’s Post Road in Edison, New Jersey.